Fetal Bovine Serumn (FBS) is an essential component of culture media that is used to grow cells in vitro. It contains a variety of proteins/growth factors which suport growth and proliferation of cells cultured ex vivo. One of the main characteristics of FBS is that It has low levels of antibodies which may be harmful to cultured cells. According to scientific literature, FBS is the most widely used culture media supplement needed for culturing eukaryotic cells of different origin. Our FBS is produced to the highest industry standards in order to reduce the risk of contamination, minimize product variability and ensure product safety combined with its high performance: it is 9CFR-tested and meet FDA/USDA requirements. 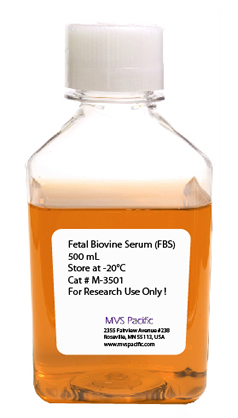 Fetal bovine serum products can also be tested to meet EMEA requirements. Each lot of FBS undergoes rigorous testing using in vitro cultures of primary human cells as a model. We source our FBS cell culture medium supplement from United States (NOTE: it can be also sourced from Australia, New Zealand, as well as USDA approved regions in North America). These standards are built into entire supply chain. Ordered FBS is guaranteed to be delivered exactly matching the specification provided to us by the customers. Our stock contains a variety of grades of FBS, including charcoal treated, heat inactivated, and low endotoxin levels. Per request we can customize our FBS product to satisfy requirements of specific cell culture conditions.